Ruby May (Archer) McFarland died April 7, 2016 in Oklahoma City at the age of 105. Ruby was born January 26, 1911 on the Buckhalter homestead northeast of Cheyenne in Roger Mills County to William Walter and Mary Ellen (Rippy) Archer. Growing up, Ruby worked milking cows and farming. She graduated Valedictorian of Strong City High School in 1929. After a four year courtship, Ruby married Elige James McFarland on March 24, 1932 in Strong City. Ruby and Elige later moved to McAlester where they raised their family. 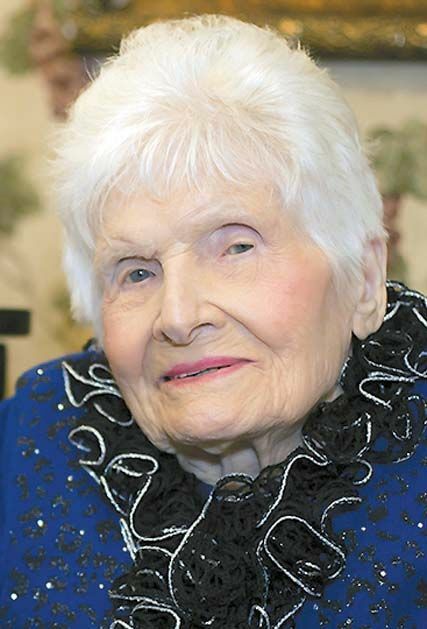 Ruby was a leader in her community, where among other activities, she gave the Farm Report on Radio News, was a 4-H leader, and Civil Defense Chairman. Ruby worked sewing for the family, gardening and tending to cattle. Later she worked at Sunbeam Children’s Home in Oklahoma City and then moved to Wilburton as a Dorm Mother for Choctaw Hall at Oklahoma Eastern State College for fifteen years. Ruby was well traveled and experienced everything from the dust bowl to the age of technology. She traveled to the Gulf of Mexico, the Alps, Holland, England, Paris, and had traveled to all but four of the States. She lived an amazing life full of hardships and triumphs that she overcame with grace and humility. Ruby had a kind and generous heart. God was important in Ruby’s life and she instilled a strong work ethic in her children. A life can be measured in so many different ways but the only way that actually counts is the legacy, that one ripple in the rivers of life that has touched every shore. Ruby is survived by, daughters: Margaret Laurence and husband, Winston of Moore, Oklahoma and Lucille Cavallo of Madill, Oklahoma; grandchildren: Kathleen Stevens and husband, Pete, Mike McFarland and wife, Robin, Danny McFarland, Diana Robison, Rance Robison and wife, Cathy, Ray Robison and wife, Danis, Charlotte Hill and husband, Scott, Randall Robison and wife, Ginger, Teresa Cavallo, Terry Cavallo and wife, Angie, Shawn Cavallo and wife, Kara, Antonio Cavallo and wife, Stacy; Mark Laurence and wife, Connie, and David Laurence; Thirty-five great grandchildren; twenty great-great grandchildren; sisters: Hellen Ellingwood of Eureka, California, and Mary Patton of Ulysses, Kansas; along with numerous nieces, nephews, other family members, and friends. Ruby was preceded in death by her parents, William and Mary Ellen Archer; step-mother, Lura Hapgood Kirksey Archer; sons, Elige McFarland, Jr., Walter McFarland; great grandson, Mark White; brothers, Charlie Archer, Lonnie Archer, Burwin Archer, Keene Kirksey, Orval Kirksey; sisters, Nellie McClellan, Ola DePavo, Veryl Culver, and Ruth Archer. The Funeral Service will be 2:00 p.m., Tuesday, April 12, 2016 at Bishop Chapel of Memories with burial to follow in Oak Hill Cemetery, McAlester. Pallbearers will be: Danny Mc- Farland, Ray Robison, Randall Robison, Shawn Cavallo, Thomas Aaron Shipley, and Curtis Gobin Honorary pallbearers will be: Terry Cavallo, Kathleen Stevens, Diana Robison, Teresa Cavallo and Charlotte Hill. Arrangements are entrusted to Bishop Funeral Service. PreviousTroyt “Shot” Loyal Banks, Jr.